Maybe you can use these for your Christmas projects, or as gift tags with your Christmas gifts? The fonts are both free: Fancy Card and Dearest. Oh my, these are just too adorable!!! It never ceases to amaze me the sweet papers you come up with. 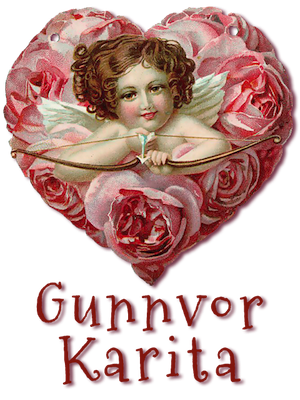 I can’t thank you enough, Gunnvor! Oh my goodness gir you have outdone yourself with these! They are gorgeous!! Both this and the last entry here is absolutely gorgeous. I´ll print some of the Boston scenes for saturday, when we´re going to Trines birthday, as I know, the girls are sooo crazy about these things, and will sooo enjoy to make them, as we begin to run out of time ehre before christmas, as they also wants to finish all their homemade presents too in time for christmas, and we have a lot of other things on the go here too, I´m afraid. Good luck with celebrating birthdays and baptism, enjoy your wonderful family, and your day off!!! I just love the art of Margaret Tarrant, thank you so much for these beautiful tags. Thank you also for the Christmas items from the 2013 folder. I am going to try and make the cones this week. Gorgeous art work on these tags. Thanks for EVERYTHING! Have fun this weekend. I’m jealous…I would LOVE to attend a craft work shop taught by you. Love, love, the pixie tags! These will be tied on little cookie bundles as gifts. They are wonderful. We’re hoping to create some of your wonderful little paper houses this year and make a little winter village. Thank you so much for sharing your talent with us all. So adorable Gunnvor, thank you so much!